Our friends made us another Vegan roast on the weekend, and we enjoyed it so much there were no pictures. 3. 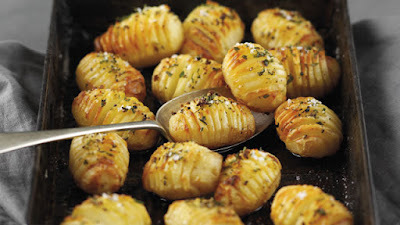 Put in an oven tray and douse with your preferred oil (olive oil was very good), salt, a few garlic cloves and rosemary. 4. Cook for about 45mins to one hour, until they are golden brown. They fan out in the oven and cook right the way through, achieving the crispy coating and soft inside. Will definitely be doing this at Christmas!